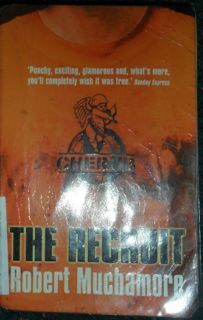 I hadn’t given The Henderson Boys series by Robert Muchamore a try because the boys who loved CHERUB couldn’t get into. After finishing People’s Republic I decided it was time to read one. I found them unsettling but good. The detailed image of the characters in France as Germany is taking control WWII was very well described, maybe too graphic and complex for my young CHERUB readers. They want action and had gotten used to the CHERUB characters having it pretty good in between acts of heroism. 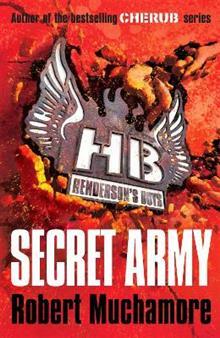 The Henderson kids have it rough, very rough, and the set up of the story takes a long time (s0 it should because Muchamore hasn’t assumed his readers understand what it’s like to live through a war).I have just finished the third installment, Secret Army, I like the books and I think I get why my young readers don’t. I think this series is for a different type of reader and could hook an older boy or dad, but because it was promoted as the prequel to CHERUB in my library it has missed it’s audience. The style of writing that suited CHERUB doesn’t equate with Henderson Boys, short chapters and convient quick conclusions don’t work as well with an older reader.I will try moving to the Senior Section of my high school library and promote to older kids, who haven’t hooked into CHERUB. I will definitely recommend to the boys who want to read war books, this way I think there will be a life for Henderson Boys in my Library. My customers were feeling quite sad last year as they returned Shadow Wave, from the CHERUB series by Robert Muchamore, because it was the last and they were going to miss everyone at the academy. I also felt disappointed because I enjoyed it as much as the 12-year-old boys it was aimed at and a series that grips boys enough to fight over the next reserved copy are few and far between. Sadly none of my readers hooked into The Henderson Boys, which they were supposed to I guess. Anyway, luckily for us CHERUB has been reborn, with a new group of 11 year olds, which hopefully will keep the series going for some time. I started People’s Republic, which I had brought home for my son, on Friday evening because the two books I was trying to read weren’t holding my interest. Well, it was like stepping into a warm bath- a familiar gripping style, plenty of action, good research, a moral and revealing lesson in child/women trafficking. Part of the charm of these books is the easy style, large print, big margins and short chapters, it seems a sure method for holding his readers attention. I had lots to do over the weekend and the book is 407 pages but I was finished by Sunday 9.00pm. while some parts of the story resolved themselves, there is much more to come and I can’t wait.